George "Buddy" Guy (born July 30, 1936) is an American blues guitarist and singer. 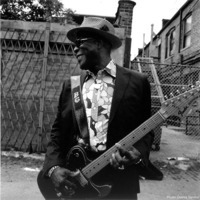 He is a critically acclaimed artist who has established himself as a pioneer of the Chicago blues sound, and has served as an influence to some of the most notable musicians of his generation. Guy is known, too, for his showmanship on stage, playing his guitar with drumsticks, or strolling into the audience while playing solos. He was ranked thirtieth in Rolling Stone magazine's list of the "100 Greatest Guitarists of All Time". His song "Stone Crazy" was ranked seventy-eighth in list of the 100 Greatest Guitar Songs of All Time also of Rolling Stone.